Last week, I used my 50% off coupon for Value World to score this cute dress for only $2!! 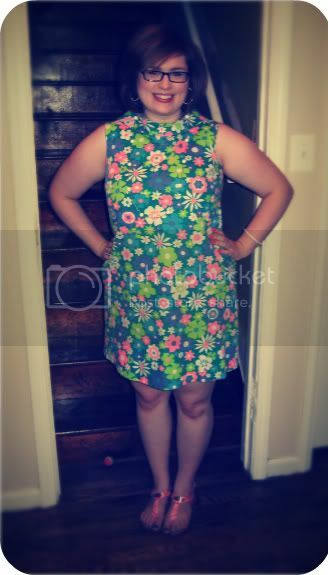 (Originally $4) It's a late 60s number from Sears made out of a heavy cotton. I must really be into the tent shape right now because this is at least the second dress that I have purchased in the last month that is in this shape. I debated on whether or not to belt this dress, and the non-belted look won out. Isn't the flower print darling? You totally scored with this one. Adorable. Don't belt it - it's still too hot outside. Love your curb-side goodies! You KNOW that I have dumpster dived! LOL! Wow- $2 is a great deal. The print is great!